Science as we know it — complete with the scientific method, formation of hypotheses and systematic subjection of hypotheses to testing with planned experiments — did not take form until recent centuries. But scientific thinking dates back about 2,600 years to the Greek philosophers of Ionia. In upcoming posts, we’ll profile some selected thinkers of the Ionian region and also expand outward through the rest of the Greek world and its environs, and forward in time, but let’s being with some perspective on who the Ionians were and how they were different from, and similar to, those who shared the world around them. When we talk about Ionia in the centuries leading to classical Greece, we mean the western coast of Asia Minor, Anatolia, the region of modern-day Turkey, and the plethora of islands scattered around the eastern side of the Aegean Sea. The name Ionia needs some historical context to avoid confusion because mainland Greece lies on the western side of the Aegean. All the way to the west of Greece is the Ionian Sea, which must be crossed to get from Greece to southern Italy. 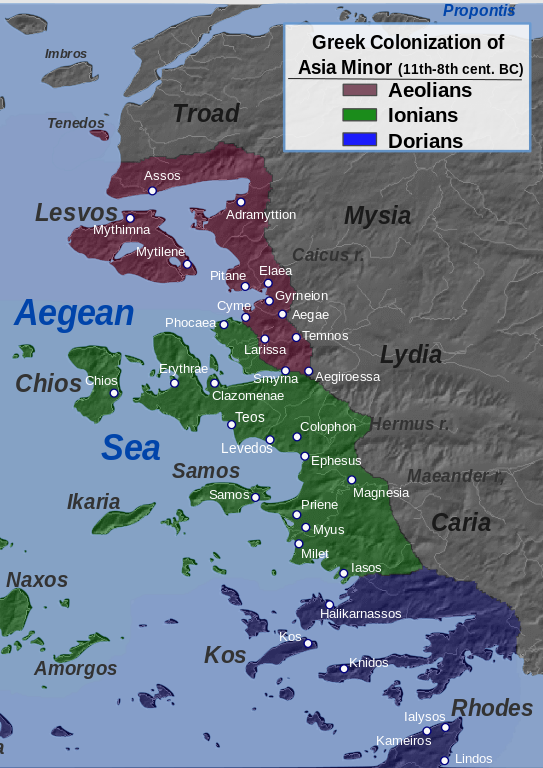 Ionia and the Ionian Sea both get their names from a people, the Ionians ,who were living in Greece at the end of the Late Bronze Age, when a Greek civilization, called the Mycenaean civilization, declined around 1,200 BCE. Around that time, or a little later, a group of people called the Dorians “invaded” or migrated into Greece from lands to the north. This was a time of dramatic changes, when Egyptian and Hittite empires whose competition for many centuries had defined politics at the eastern end of the Mediterranean collapsed. It was the time of the Trojan War. As Mycenaean civilization collapsed, the Dorians displaced the Ionians, who took to the sea and made their way to the lands to the east over which the city of Troy probably had held sway before the Mycenaean Greek armies were dominant. Traditionally, the time period from the Dorian invasion in the 12th century BCE up to the 6th century BCE has been called the “Greek Dark Age.” But the Dorian invasion is considered a formative event in Greek history, for it set up the structure and populations that would move Greek history forward. And when it comes to the emergence of Greek philosophy and, connected with that, scientific thought and proto-science, these were the formative centuries for the Ionians, the people who would get everything started. Geography is central to the story. Consisting of small cities in islands on the Anatolian coast, Ionia at the end of the 7th century BCE was a seafaring merchant society. The people spoke Greek, having ancestry in Greece proper, but they were living within the sway of the Kingdom of Lydia. Fishing and trade activities brought Ionians into contact with people from diverse areas, from the Black Sea to the North, Egyptians, and especially the Babylonian Empire. Babylon, although new on the scene in terms of its ruling dynasty and the fact that it had risen up over a matter of decades, had been the center of an earlier empire and was an ancient civilization. In 600 BCE, Babylonians were the most technologically advanced people of the era, their mathematical capability was far in advance of literally everybody else. They were excellent at taking measurements and recording their data, particularly when it came to astronomy. They had nothing that we could call science, as everything was about measurement and prediction based on patterns that were interpreted from their data. They did not formulate physical models of nature, nor, as far as we know, did they propose that the things that they were observing, measuring, and analyzing with mathematics might be explained, rather than simply being accepted as the result of the activity of the gods. 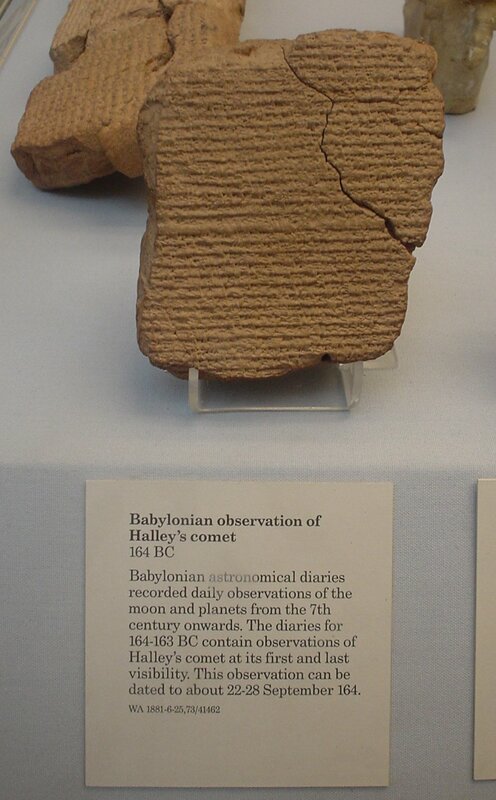 A Babylonian tablet recording Halley’s comet during an appearance in 164 BCE (British Museum, London). This is where the Ionians came into the picture, possibly as one of several developments in human thinking that were popping up within the areas under Babylonian sway, and regions to its west and east. Jewish monotheism, for instance, was emerging on the scene among Jews that had been exiled from the land of Judah to the Babylonian heartland. A similar world view was Zoroastrianism, that started up a little more eastward, in Iran, but certainly was related to the monotheism of the Jewish exiles. Still further east, in Nepal, Buddhism may have been emerging at this time (or possibly slightly later), and China was just decades away from the time of Confucius. Old ideas were being replaced, and the Babylonians were tying that part of the world together with laws, roads, and a postal service, so various ideas were ripe to be amalgamated and rethought. Meanwhile, the Pharaoh Necho II in Egypt had built a canal to connect the Nile River to the Red Sea, and through that canal. Setting on through that canal, on Necho’s financing, a Phoenician expedition was on its way to circumnavigate the continent of Africa. The trip took about three years, and when heading west, around the Cape of Good Hope, they noticed that the Sun was on the right, the reason being that they were far south of the equator. It would take a few centuries for humans to figure out the geographic details that the Phoenician observation implied, but in hindsight it was quite an important discovery. In Ionia, meanwhile, the new idea was that nature is knowable. Instead of uniting all the gods into one, or trying to unite the mind with the rest of the universe, the Ionians were thinking about the world in ways that didn’t require any gods, at least not personal gods. In upcoming posts, we’ll see that the earliest Ionian philosophers actually did speculate the existence of what could be called non-corporeal, or at least unseen, forces as the basis of all things. It actually took a couple of generations before the Ionian way was fully materialistic, mechanistic, and naturalistic with no appeal to something that could not be understood. In evolving to strict naturalism, however, the Ionian philosophers created physical models of the universe and in doing so set the groundwork for the emergence of science, and along with it the birth of philosophy. 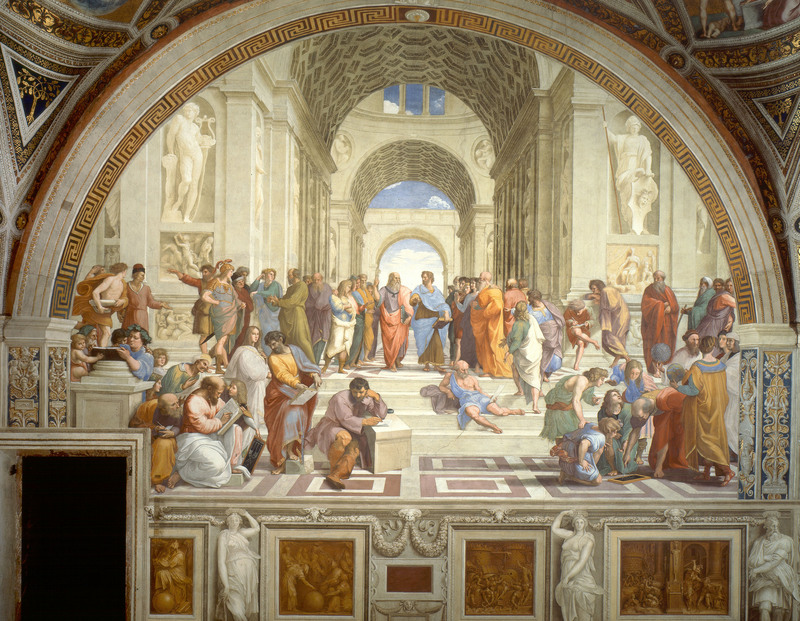 The School of Athens fresco by the Italian Renaissance artist Raphael, including early scientific thinkers like Anaximander. This does not mean that all Greeks agreed with them. In fact, at the other extreme of the Greek world, in Greek colonies of southern Italy, earlier philosophers developed in directions quite different from the Ionians and were just as influential on the world, if not more. In terms of the birth of science, however, Ionia was the place to be. The emergence of Ionian philosophy has been called the Ionian Enlightenment, or the Ionian Awakening, and it started around the year 600 BCE with a man called Thales. We’ll look at his story in the next post.